As mellifluous melodies of love and longing flow joyfully through my mind, MacBook, and fingers; painting acoustic watercolors of magic on the air; and as poetry streams through my enchanted consciousness, inspired by my soulmate, so sweet and rare; my life naturally adjusts, creating balance, what dreams I wear. When things change in our lives, especially when our entire life transforms around a new relationship, career, or living situation; we may need to reestablish balance in our lives. If the changes derive from a spiritual origin (from the true nature of our spirit), then we will probably experience them joyfully, and the transitional processes, despite their inevitable challenges, will likely unfold naturally and effortlessly. This does not mean that they will be free from pain or suffering. It means that we will greet their anticipated challenges with acceptance, realizing that they are normal, healthy parts of life. Viewing changes from this perspective will allow us to see them as natural, like the pain experienced during our childhood growth spurts, or following an intensive weight training workout. It is nothing to fear. It is just a natural part of life. If we can see it this way, then it will completely change how we experience it when it happens. We will not respond to it with negative emotions, or other forms of resistance, and our acceptance of it as normal will contribute to its effortless unfolding (like dealing with the expected pain following an ab-burning workout). Parts of it will hurt, but we will expect this, and understand that it is normal. When we respond to changes in this way, our lives will likely reestablish a balance as naturally and effortlessly as our acceptance of the changes. Things will just happen; to accommodate the changes; to create the needed energy; or to help us realize that many of the things that seemed so important before are no longer our priorities. If we are unable to view these transitions from such a spiritual perspective, then we may encounter various forms of resistance, including stress and other negative emotions. If we do, then our brain will shift us into a fight or flight mentality, and everything will suddenly seem different. It will feel like we need to fight against or run away from a threat. The changes, or the processes surrounding them, will seem negative, overwhelming, unmanageable, and stressful; and we may decide not to complete the transition because of how we are perceiving it. It may seem daunting, impossible, or like too much to deal with. And the only difference would be the perspective from which we were viewing it (resistance rather than acceptance). This could also result in our starting, then stopping because of our negative emotions, then starting again, then stopping, etc. 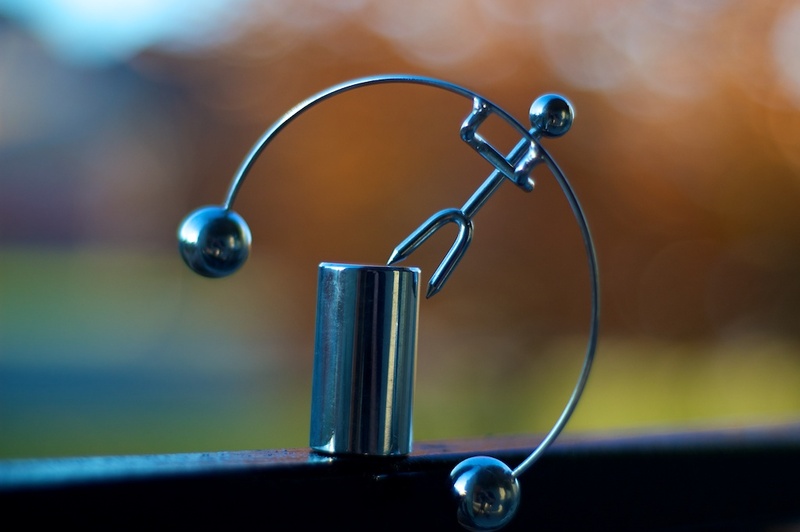 Whether we stop it altogether, or do the approach-avoidance dance; finding a balance could be complicated by our negative emotions and the impact they have on our lives (much more complicated, unclear, and unstable). There is an amazing benefit from attaining and living in a spiritual place. When we’re in the flow of universal consciousness, things have a way of falling into place, creating a natural balance, and forming new priorities and directions effortlessly. Within this spiritual place, things are gentle, clear, and bright. We are not letting our mind turn something beautiful and perfect into worry, fear, stress, regret, or guilt. We can see it clearly from the view of higher consciousness. We need no permission. We have our own. We need not follow the rules. We make our own. We do these things from a position of self realization, within which the highest purposes are being served, regardless of how it may seem to others. Whether freeing slaves, when some believed they were their property, like cattle; or secretly helping targeted groups escape to freedom in Nazi Germany, or smuggling those of other faiths out of their death sentences during the Christian Crusades; or countless other things; there are times when we must establish our own higher authority in orderd to help facilitate needed changes (on a large or small scale). From the perspective of our spiritual awareness, everything will stand revealed, luminous and radiant, clear and real. We will have no hesitation. It will be a matter of how to make it happen, rather than whether or not it can be done. And during the process things will occur with acceptance. As we balance, and re-balance our lives, during and after the transitions have occured; the re-established balance will be met with alacrity, grace, and acceptance. This spiritual destination can be reached from many different paths. What works for one may not work for another. We have all experienced some miraculous moments within which we saw, felt, or knew something bigger than our minds could make. It may have happened during an experience of pain or trauma, a joyful epiphany, or a relaxing time shared with nature. We may have sensed something just before it happened, been aware of someone’s pain or joy from a distance, felt the emotions or energy of another, or shared an amazing intuitive connection with a soulmate. We may have become aware of a bright light, warmth, or tingling sensation with our eyes closed that contained information about something relevant in our lives. We may have felt great joy and sensed the presence of something bigger than ourselves while singing a song, watching a movie, or reading an entrancing story. These are a few examples of being in this spiritual flow. When you look back, you will probably find some of them in your own life. When you do, focus in on them. Tune in, as deeply as you can, to the experience. Try to see it, hear it, touch it, smell it, and taste it. Remember what it felt like. Meditate before doing this, and then again afterward. Keep a journal to help you keep track of what happened. Keep meditating, exploring, and practicing until this place is more familiar to you, and easier to access. Make sure you write down all of the examples of these spiritual occurrences, so you can find them again when your mind might be blocking your access to them (when the fight or flight response is triggered). Remember, we cannot access this place when experiencing negative emotions. And then just keep practicing until you find clear access points and can arrive at the desired destination with intention. It could prove useful to find a practice partner. It is extremely helpful, and can be lots of fun, to practice sending and receiving intuitive messages, comparing notes, and sharing enthusiasm as we gain access to higher consciousness.